Using public transportation, you can either take the metro blue line to Kungsträdgården and walk across the bridge to Skeppsholmen. You can also take bus no 65 (goes from the Central Station) and get off at Arkitekturmuseet / Moderna Museet. We are located right across the street when you get off the bus. Please call before visiting. 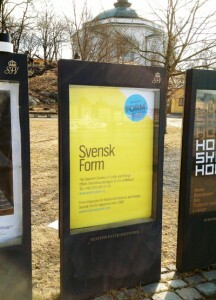 Please note: We have no exhibitions at Svensk Form.